In May, U.S. Immigration and Customs Enforcement (ICE) imposed the deportation program known as “Secure Communities” (S-Comm) throughout New York State. The news came as a shock to most advocates who had secured an important victory less than a year ago by convincing Governor Andrew Cuomo to suspend the program indefinitely. What happened also serves as a lesson about the challenges of fighting a federal immigration policing regime that few have questioned systematically. As ICE and its supporters like to tell it, S-Comm is simply a data-sharing program: shortly after arrest, the police send the fingerprints of all arrestees not only to the FBI (which has long been standard practice) but to federal immigration databases as well. Those who ICE suspects of being deportable are then tagged through a “hold,” also known as a detainer. These holds request that local law enforcement delay the release of arrestees in order to give ICE an opportunity to transfer them directly into the deportation system instead of allowing them to return home to their families and communities. But for immigrant communities and their advocates in New York and across the United States the story is very different. “Secure Communities” represents the antithesis of its Orwellian name. When police officers become de facto immigration agents, communities are fearful of reporting, or cooperating in the investigation of, crimes—thus compromising community safety. At the same time, S-Comm acts as a wide dragnet, sweeping all types of immigrants into the fold (yes, even green card holders, or lawful permanent residents), including those who have minor convictions or those who eventually are found not guilty. 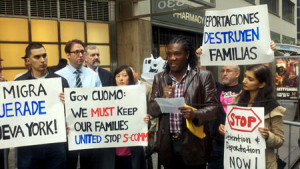 It was in response to revelations that New York State had signed a memorandum of understanding with ICE in 2010 to facilitate the implementation of S-Comm that a coalition of immigrant rights, labor, faith-based, domestic violence, LGBT, family services, criminal justice, anti-trafficking, and civil rights groups came together to fight the program. The members of the New York State Working Group Against Deportation agreed with other advocates across the country that it seemed profoundly unjust for those who had “done nothing wrong” to be deported. Our main point, however, was that all deportations under S-Comm needed to be stopped, as the program’s core function was, and still is, to funnel people into a deportation system that is fundamentally unfair. The reality is that the U.S. deportation system barely makes a pretense of providing a fair trial. Most people are forced to defend themselves without the help of information, loved ones, or lawyers while locked up in detention centers often thousands of miles away from their homes and with few options available to allow them to stay. Under these conditions, we cannot justify sending anyone into detention and deportation, a system that only compounds and exacerbates the unfairness that many immigrant and low-income communities of color have historically faced through the criminal (in) justice system. That is why we launched our statewide campaign to protect the rights of all immigrants, regardless of status or criminal record. We recognized that, in this dismal political climate, the mainstream immigrant rights movement had become accustomed to pursuing small changes at best. The movement has accepted—and has often been at the forefront of promoting—the argument that some immigrants (“the deserving”) are worthy of staying in the United States while others—namely, those with criminal convictions (“the “undeserving”)—deserve deportation. This is why a tagline like “We are not criminals,” which have been popularized in campaigns that argue for the legalization of undocumented immigrants, has become so firmly entrenched. For the mainstream immigrant rights movement, even raising the issue of the rights of immigrants with criminal histories is, at best, a non-starter. In this regard, in convincing Governor Cuomo to suspend S-Comm in New York State in June 2011 seemed particularly stunning. However, very quickly the precarious nature of our victory became apparent. Shortly after New York and a few other states refused to participate in S-Comm, ICE decided to unilaterally withdraw the memoranda of understanding governing the program’s operation that it had campaigned so hard for states to sign, claiming that the agency could and would move forward with activating jurisdictions despite widespread objections. We heard nothing until ICE suddenly and without notice activated S-Comm in the entire state two months ago. We later learned that ICE and the FBI had decided to proceed with making their agencies’ databases interoperable—meaning they could share fingerprints on their own and sidestep New York’s involvement entirely. Still, we cannot claim surprise at ICE’s persistence in getting New York activated. ICE’s own documents reveal the extent to which activating S-Comm in New York City had been a priority of the highest magnitude for the agency. According to ICE, given that nearly 9% of all those that it labels “criminal aliens” live within the City’s limits, the agency cannot achieve its deportation objectives without having S-Comm “go live” in New York State. Similarly, the blithe manner with which Obama has demonstrated a commitment to increasing, or at least sustaining, current deportation levels across the United States is hardly surprising. Neither the Administration’s recent lawsuit against Arizona’s harsh immigration law nor the various incarnations of reprieve from deportation for certain populations, such as undocumented youth, has done anything to slow down its deportation apparatus—one so powerful that it brazenly operates with virtually no regard for transparency or accountability. To the contrary, the Administration has made clear that while it will reconsider on a limited basis the deportation of certain populations deemed worthy, such policies only further enable the government to amplify its efforts to deport immense portions of the rest of our immigrant communities. We would be foolish, then, to expect much from the needed overhaul of laws when Obama seems to maintain such a feverish adherence to the broken immigration system he claims to want to reform. He himself seems to be relying on selling the U.S. public small tweaks while ignoring the big picture. We need to hold Obama accountable and demand meaningful action. But we should also admit that the path Obama has taken is one that the U.S. immigrant rights movement has been complicit in paving. We in the immigrant rights movement have implicitly and explicitly made it clear that we privilege certain groups over others, and that those immigrants whose lives might present complications can be rather easily disposed of. In other words, we have settled for troubling compromises, instigated divisiveness among immigrant populations, and refused to demand systematic change—all in the name of pragmatism. While we may disagree about the rightfulness or wrongfulness of these efforts, most of us can agree that they have not paid off. This entry was posted in Press (New York) on July 11, 2012 by Ian. Please enter your email address if you'd like to receive updates on this campaign to your inbox.